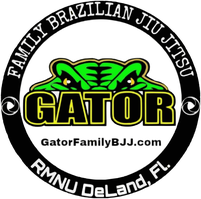 Kids BJJ Program - Gator Family Brazilian Jiu-Jitsu, DeLand Fl. Kids classes rock! 5 to 12 year olds learn Confidence, Self Control, Patience, Teamwork, and Self Defense techniques to defend themselves in the real world. NO BULLYING! Kids are welcome to participate in a Free class. We offer affordable rates with several options. Contact us to schedule a free class. Kids classes start with a 10 minute warm up of Jiu-Jitsu related drills. The Instructor then demonstrates a single technique several times. Students are partnered up and drill the technique. We have "Mat Chats" focusing on Leadership, manners and current issues. Instructors work with all students to ensure any questions are answered. The final portion of class is where students put all of the techniques in action and have hands on grappling. All of our students understand that our number one training tool at our academy is our training partner. We always respect our partners and do not train out of control. Competition is encouraged but not mandatory.